Paul O’Hara added to an impressive Tartan Tour title haul over the past few years by claiming victory in the £50,000 P&H Championship at The Renaissance Club in East Lothian. 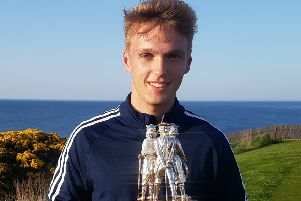 In a buffeting wind, the 29-year-old overcome the agony of seeing a 10-foot par putt hang on the edge of the hole at the last to beat his Clydeway Golf counterpart, Graham Fox, in a sudden-death play-off. O’Hara, who has dominated the young professionals’ events on the circuit since entering the PGA system, won with a par at the first extra hole after Fox had been bunkered off the tee. “This is probably my second biggest win after the one I recorded on the EPD Tour (in Germany in 2011) with a 20-under-par total,” admitted O’Hara, who picked up a cheque for £5600 to add to the £1000 he’d secured as leading trainee after two rounds. On the toughest of the three days on the Tom Doak-designed layout, the three-time Scottish Amateur runner-up closed with a 74 after opening with back-to-back 68s. He came to the last holding a one-shot lead over Fox, who’d carded a best-of-the-day 68 to set the clubhouse target of three-under 210, but three-putted from the front edge. To his credit, he quickly regrouped to ensure that the title wasn’t going to be ripped from his grasp by Fox in the sudden-death shoot-out. Playing the first hole, O’Hara almost holed his third shot from a greenside bunker before Fox missed with a 10-foot par attempt to extend the play-off. “I’ve played solid over the past few days,” admitted the new champion, who has been on fire since he linked up with Eastwood professional David Orr last summer. Both Fox and third-placed Greig Hutcheon headed straight off to catch flights to London as they are both playing in the BMW PGA Championship starting at Wentworth on Thursday morning. “I played pretty poor on the second day but sent a few swings to my coach, Ross Aitken, and he confirmed a couple of things that I need to exaggerate,” said Fox. Hutcheon, who is now attached to the newly-opened Paul Lawrie Golf Centre Inchmarlo, described the final round as a “day for surviving” in the testing conditions. On heading into the European Tour’s flagship event without a practice round on this occasion, the former Tartan Tour No 1 added: “This is one of the best tournaments we have and it is played at a great course. Elsewhere, former Scottish Amateur champion Michael Stewart made a promising start in the PGA EuroPro Tour’s IFX International Championship at Burhill in Surrey. The Ayrshireman carded six-under-par 66 to sit joint-third, two shots behind pacesetter Greg Payne from Chobham.